Vintage is a lovely stallion, well bred and easily handled. He has been out on lease to the Stow and Hollydell studs and is now back with us. Unfortunately we also have his full brother Brockville Venture who is being retained and so we have decided to offer Vintage for sale so that another stud can take advantage of his superb bloodlines. Please contact us for futher details. Mischief is one of four daughters at the stud out of our best chestnut mare Merry Melody. She is a lovely young mare who is impeccably bred. 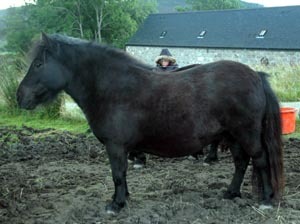 Her sire, Beaudesert Dark Voyager is by Threapwood Venture and out of Drum Sonia so carries many old Wells bloodlines and her dam is by Kirkbride Diamond and out of Weewaif Merry Mullein who is Netherley bred. Mischief is very friendly and would make a good ridden pony as well as being suitable for in hand showing and breeding. Having sold several of our stallions and colts during the summer we now have some superbly bred mares and fillies for sale. They are mainly blacks, bays and chestnuts ranging in size from 38" - 41". Some photos of them will appear on this page shortly. We also have just a few 3 & 4 year old 40" colts left all of which would be very suitable for riding or driving. 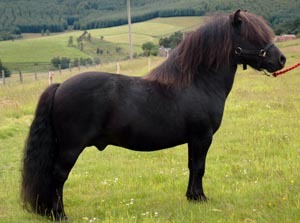 All ponies are reasonably priced.